Form 38-ES or the "Estimated Income Tax'-estates And Trusts" is a form issued by the North Dakota Office of State Tax Commissioner. 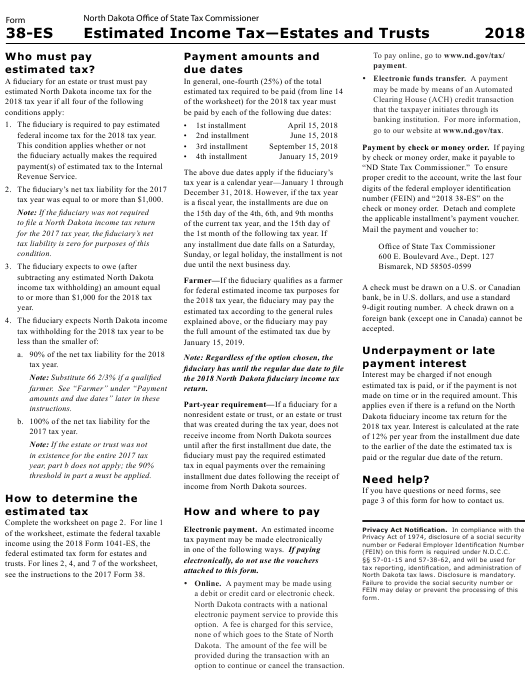 Download a PDF version of the latest Form 38-ES down below or find it on the North Dakota Office of State Tax Commissioner Forms website. go to our website at www.nd.gov/tax. federal income tax for the 2018 tax year. tax year was equal to or more than $1,000. the applicable installment’s payment voucher. due until the next business day. paid or the regular due date of the return. threshold in part a must be applied. income from North Dakota sources. page 3 of this form for how to contact us. (FEIN) on this form is required under N.D.C.C. see the instructions to the 2017 Form 38. North Dakota tax laws. Disclosure is mandatory. a debit or credit card or electronic check. option to continue or cancel the transaction. If a resident estate or trust, calculate the tax using the 2018 Tax Rate Schedule below. If a nonresident estate or trust, complete lines 15 through 19 below. Relay North Dakota at 1‑800‑366‑6888. instructions for applicable due dates. quarter of 2018, enter the overpayment on the applicable quarter’s line. Make check or money order payable to "ND State Tax Commissioner." Write last four digits of FEIN and "2018 38-ES" on check or money order.